One of my favorite products - I personally use these almost every ride! Available in High Wither and Broad back. Part of the Concept Range, these pads are contoured to the back to ensure that movement is eliminated. They were designed with the help of the Pliance Pressure System. Different back types allow a pressure and wrinkle free fit without "hammocking." Machine Washable, will not shrink. 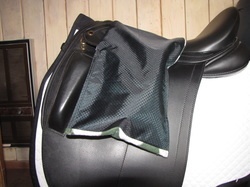 Shaped to fit most jump or dressage saddles. 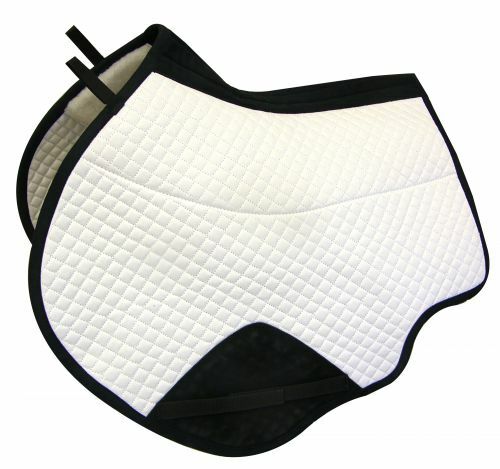 Available in Dressage and Jump styles and all black, all white, white with black trim and black with white trim. These beautiful and highly tested bridles are custom ordered to your horses head and have fully interchangeable parts to suit a variety of disciplines and tastes. 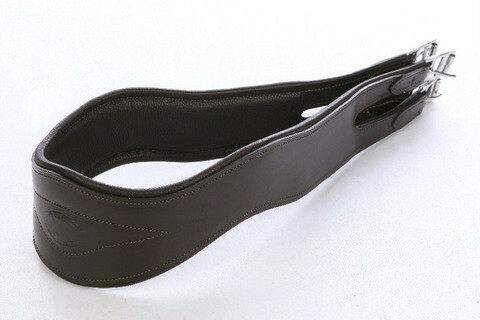 Available in snaffle, double, figure eight, drop and standard noseband styles and strategically padded with prolite. Visit fairfax bridles for more info. Bridles are available through other companies as well. Prices vary based on design and brand. This smart little product is made locally by a friend of Dr. McCoy's. They feature easy clean nylon outer layer and stirrup pocket (just flip inside out to wipe out any dirt that accumulates from the irons). They are completely lined with soft fleece and available in a variety of colors. 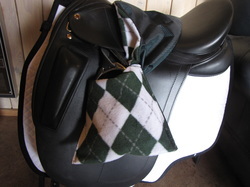 A great way to protect your saddle from rubs and dirt while not in use. Pockets are made generous enough for modern deep styled jumping irons or can be made smaller for children's irons. Monograms available too! Sofie also makes custom beaded brow bands, saddle covers and embroidery for all your equine and business needs. She has access to top quality apparel and saddle pads too! Please visit http://www.sequinedesign.com for more info or to contact Sofie directly! Formulated especially for Traditional English Bridle Leather. Replenishes fats and oils which leech from the leather in use, penetrating and restoring its original suppleness. Includes natural wool wax to impart water repellency. Adds animal and vegetable waxes to impart a lustrous shine when buffed. 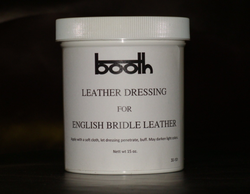 Booth Leather Dressing is made from all natural products, and does not contain solvents or petroleum derivatives. No chemicals which can strip the fibers' natural lubricant and de-tan vegetable tanned leather.